Drawing inspiration from the approachable aspects of the original midcentury rancher — the strong connection to the outdoors and an emphasis on casual gathering— the resulting home is grander and also more permeable as the living room (sited in the same location as the original) features a 40-foot wide sliding glass door. Plush textiles, organic forms in the furniture and hand blown glass light fixtures, and a meandering landscaped stream balance the strong steel and timber framed form of the home. Check out our portfolio page of Calcaire here. The client wanted their building in the RiNo district to carry forward the neighborhood’s industrial character…Collegiate Peaks saw an opportunity to respect the visual stability and sense of permanence that are fundamental to banking while embracing the neighborhood’s dynamic optimism. Embracing place and purpose, the bank design blends “refined natural materials and an angular industrial attitude” as the bank’s north wall and demi-arch roof line incorporate CLTs (cross laminated timber) and structural steel in search of an iconic presence. Taking inspiration from the neighborhood’s bow-truss warehouse building of years gone by, the white painted steel wall and roof line arcs over a glass box with materials flowing from exterior to interior. Check out the full article within the Fall 2018 issue here and our portfolio page of CPB RiNo here. Hubbard's previous work on 19th-century farm structures that once abounded north and east of Boulder inspired his modern-farmhouse vision. "I wanted to bring forward some of those details and capitalize on the idea of 'stumbling upon a country farmhouse,' right here in the middle of Boulder," he says. The lot was conducive to this stumbling, with its long driveway off the street and around a bend, leading to a house hidden among the trees. Check out the full article within the May 2018 issue here and our portfolio page of Geneva park here. [Principal Architect Dale Hubbard and Project Architect Kim Cattau] worked with the high-energy family of five who lives here to create a foolproof floor plan that accommodates modern family life in it's many forms... Though the layout is designed to multitask, the home's interior finishes are beautifully focused. "The couple used a great word that we love to hear as architects and designers, and that's contrast," Hubbard says. "This theme brings a devout simplicity to the home." Dark doors, windows, and floors pop against crisp white walls. Black steel tension rods help define airy vaulted ceilings. These finishes, neither too traditional nor too stark, set the stage for the homeowners' collection of neutral casual furnishings chosen for their ability to stand up to everyday life. Check out the full article here and our portfolio page of Larkspur here. This 1920s home near Boulder’s Pearl Street has been given new life. A gut and remodel turned a honeycomb of rooms into a wide-open living area suited to a young family. At the center of this space is the kitchen, which champions the home’s century-old craftsmanship (exposed brick, graceful molding above the windows and doors, and original hardwood floors) while embracing the new (minimalist cabinets, open shelving, and new fixtures and appliances). “Old structures take modern touches in stride,” Hubbard says. The design is reminiscent of farm structures around the country that were often built piecemeal, starting with an original stone farmhouse, and as children came along, they would expand and build out with wood siding instead of stone. The homeowners and architectural team worked in sync on interior details, moving through the architecture and interior design simultaneously. Hubbard says, "We think not only about design programming details early on but what the interior is going to look like as well. Check out our portfolio page of Ivy League here. Drawing on the additive nature of agricultural architecture, this Boulder residence was conceived as a series of buildings that grew together over time, blending comtemporary, rustic, and industrial elements for this "modern barn." Responding to the owner's declared love of "single-story houses that ramble and keep you guessing about what's around the corner," this meandering ranch home features a sunken living room at its core that is flanked by the kitchen and dining room with a small conversation space and fireplace on the other. "Instead of a large fireplace as a centerpiece, the room within a room harkens back to the intimacy of the hearth room...larger living areas are vaulted with exposed beams and rafters while sleeping quarters have lower ceilings and are smaller in space." Check out the full Luxe article here and our portfolio page of Folly Farm here. Our inner 10-year-old can’t imagine a cooler place to have a sleepover than this custom, wood-slat bunk room by architect Dale Hubbard of Boulder’s Surround Architecture. He designed the ultracozy space for his client (and brother) to mimic the “dappled light of the snow gum forests” of the Victorian Alps, where the house is located. “Half of the fun of ski trips is staying up late with your mates and getting up early to hit the slopes,” Hubbard says—even if you’re still on the bunny hill. Click into the 5280 Home article here and check out our portfolio page of Moose Lodge here. A granular attention to detail provides beneficial for single-family housing, multi-family units, and commercial projects that take on warm, open, light filled residential sensibilities. The team collaborates daily within the bleeding edge BIM software Revit, a "decidedly new school approach"... [while] the powerful and raw process of creating, thinking, sketching, and talking one-on-one tried and true and equally present. Check out the Modern in Denver firm feature of various projects here. Living large with less in a light-filled home in Boulder. Awash with "unfortunate shades of Pepto-Bismol pink and avocado green," this 1958 brick ranch was given an unexpectedly hip update with an efficient floor plan, updated materials, forms, and fixtures. "My clients already had a great design sensibility...and they live a 'less is more' lifestyle, so we knew we could generate an efficient floor plan that would result in a great place for them to live and entertain...The open and layered plan minimized circulation paths. Each room naturally unfolds into the next, while varied ceiling heights help make the house feel bigger." To remedy the existing L-shaped floor plan which entered directly upon the living room and wedged the kitchen away, the owners and Surround decided to remove the roof and all interior walls for a fresh reset. The kitchen was to become "the heart of the house, a gathering space for friends and family," while the previously low ceilings were vaulted with exposed scissor trusses, simultaneously allowing for an unexpected view of the Flatirons. Full height sliding glass doors floor the new space with light and connect the home to an intimate backyard. The update follows it's way to the exterior where the existing brick was painted with washes of white, the additions clad in Wyoming snow fence, and a new breeze steel and wood covered entry porch welcomes visitors to the home. Click into the 5280 Home Magazine article here and check out our portfolio page of Old North here. "One thing we told Dale was that we love the feel of old castles." Responding to that visual sense of permanence, Hubbard conceive a sculptural home with a modernist collection of geometric forms clad with blued-steel rainscreen, Kansas limestone and tight-knot cedar.... "The stone and metal create a boundary and defend against prevailing winds from the north [wheras] on the rear or south side of the home, the indoors and the outdoors become one. When the NanaWall is open, you don't really know whether you're inside or out. It's seamless." 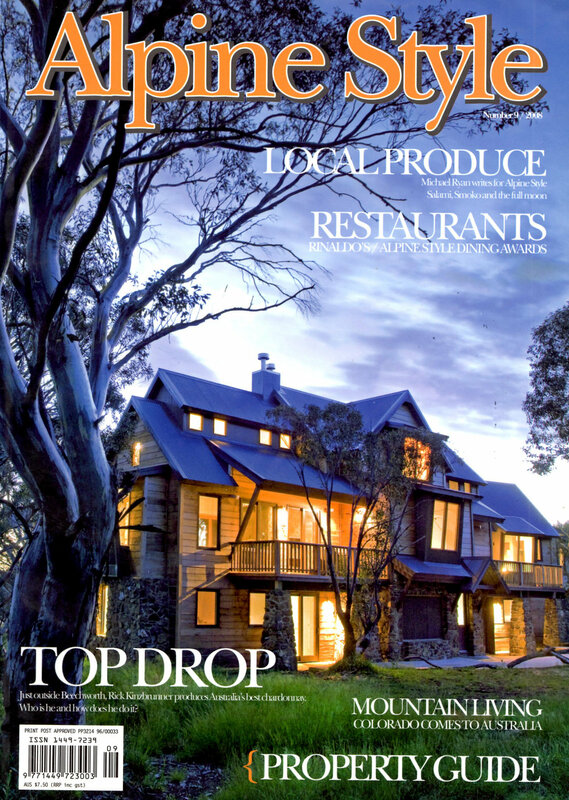 Click into the Luxe article here and check out our portfolio page of Big Alpine here. Back in 2012, Anthem Branding was bursting at the seams of its tiny A-frame headquarters. Enter Surround Architecture when the co-founders Ted Church and Pete Burhop decided to take on the a custom-designed building to comfortably house their rapidly multiplying staff and "provide enough aesthetic beauty to properly represent a company whose very essence is built around branding and imagery." Click into the Modern in Denver article here and check out our portfolio page of Anthem Branding here. Considered the "jewel" in Boulder's historic crown," this new home in the Mapleton Historic District had to tread lighting and purposefully moving forward. Although the area is dominated by stately Victorians and grand brick estates, Princess Trail "wanted to pay reverence to a certain typology, but rather than a high Victorian we opted for an interpretation of the more demure mining structures that were prevalent in this area years ago." Incorporating an existing foundation and original freestanding garage, "the house almost deconstructs from front to back." "We treat every new staircase as an exciting design element and distinct vertical space...It's not just about how you go up and down; it's what you see along the way that's important." Click into the Luxe article here and check out our portfolio page of Princess Trail here. A modern mountain house in the Australian Alps explores a new vernacular and environment set within massive snow gum trees in Dinner Plain, Victoria. "Postwar ranches like the Radas' were built for a certain family structure and lifestyle...by design they were simply structures. All the space is there; it just needs to be reimagined and updated"
The 'Little Alpine' residential remodel is featured as a 1950s-era red brick ranch whose owners were "eager to update the house without 'squashing the mid-mod charm.'" The project features an operable glass garage door along the north wall of the kitchen that "floods the room with natural light and opens to an outdoor living room." Read the full article on 5280 Home here and check out our porfolio page of Little Alpine here. How do you transform a tired ’70s-vintage law office into a creative haven? TDA_Boulder advertising (the imaginative force behind ad campaigns for consumer favorites like Chipotle, FirstBank, Izze, and Celestial Seasonings) turned to Boulder-based Surround Architecture and TreeLine Homes for its innovative new office in downtown Boulder. TDA’s multilevel, open floor plan incorporates reclaimed materials—like the exquisite glass salvaged from an aging Frank Lloyd Wright synagogue in Pennsylvania (who knew? )—for a complete metamorphosis. If having the handiwork of a master around you every day isn’t enough to keep the creative karma flowing, we’re not sure what is.